Activision is pushing things forward with its Call of Duty franchise. 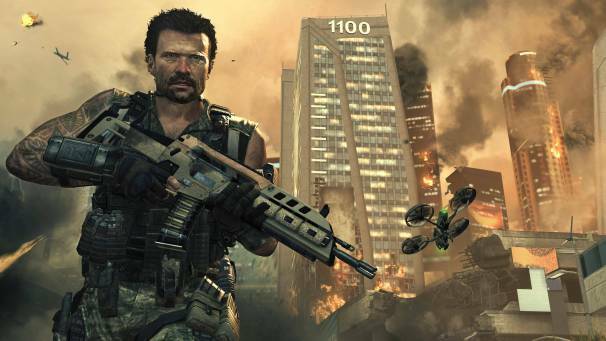 Treyarch’s Black Ops 2 is on display at E3 2012 with an epic campaign storyline that propels the action to 2025. Fans of the ‘80s will also be in for a treat with some playable levels during that period in American history, which should serve as a nice contrast to the drone and robot-controlled future warfare gameplay. Mark Lamia, studio head at Treyarch, talks about what’s in store in this November 13 release in this exclusive interview. Game On: What were your goals heading into Black Ops 2 after the success that we’ve seen, year after year, with each new Call of Duty game? Mark Lamia: The goals coming in to Black Ops 2 were quite simply to push the boundaries of the franchise. Players have had a lot of great Call of Duty experiences leading up to this point and we were really excited about what we created with Black Ops, but that was our first time together as a studio. We felt like we had just really scratched the surface of what we could create. We felt we could do so much more, so we really wanted to introduce a lot of new elements to Call of Duty. It’s a difficult balancing act. What are the challenges of trying new things with your fan base? There are a lot of people who love their Call of Duty, but when you’re making a game for such a broad audience and you’re also making a game in a franchise that you’ve made a lot of like Treyarch has, we wanted to create new experiences for players. Black Ops characteristically had a lot of uniqueness to it and we wanted to use that as a launching point in creating Black Ops 2. That’s why we took not only the near-future fiction, but made it generation-spanning and had the characters from Black Ops 1 in the game. We’re going to continue their story, but also introduce new characters, juxtaposing different kinds of warfare. The warfare that people are more familiar with in Call of Duty games will be there with a totally new kind of warfare. How does this near-future setting impact the historical aspect of past Treyarch games? Black Ops 2 features future tech, like battle drones. We’re setting it in the way we tell our fiction by looking at history and trying to explore things. There’s no history that’s written yet in the future, but we’re working with people who are experts in what’s going on in the near future in warfare and trying to leverage that to come up with our fiction. We also have new kinds of gameplay that takes advantage of all the advancements in robotics and drones, technology, and everything that that offers us. While we’re only getting into the campaign today, that mindset is pervasive throughout the entire studio. Everyone was excited coming out of Black Ops and really wanted to push not only on the campaign by introducing all this new kind of gameplay and story branching and strike force levels with sandbox gameplay and nonlinear campaign structures. That same mindset is what’s going on with the multiplayer team and on the Zombies team, as well. Can you talk a little bit about Strike Force and what that opens up to the campaign storyline? Strike Force was a goal that we had to create something that introduced nonlinear campaign structures and sandbox gameplay. We wanted to have something that had a significant element of replayability, which does come out of some of the sandbox gameplay. It also has an impact on the story. In a nutshell, Strike Force levels are all about the proxy wars that are going on in the year 2025. There’s this tension and this conflict that’s going on. Joint Special Operations Command, JSOC, comes to you in the middle of the campaign as the narrative is unfolding and tensions are rising. You’re given a choice of several global hot spots to bring your Black Ops team in and fight. It’s unlike anything we’ve ever done in a Call of Duty game because the player has a choice in the gameplay during the campaign. What’s the experience like once you drop into one of these levels? You have a choice of playing that level however you want because it’s sandbox gameplay. They’ll have unique objectives. You can take control of any of the soldiers on your squad. You can take over any of the toys of the battlefield. The drones are a great example of how we’re able to leverage the fiction for entirely new gameplay. You can fly the drones and fight with them. You can play with robots on the ground. It also allows you a good demonstration of what it’s like to fight against some of that technology that’s on the battlefield. In gameplay terms, we spent a lot of time having you fight against humans, now there are these robots and drones which have different strategies to taking them out. And you get to explore that in the campaign and the Strike Force levels.